The rain kept me inside this morning but I had anticipated bad weather and planned to run on the treadmill. 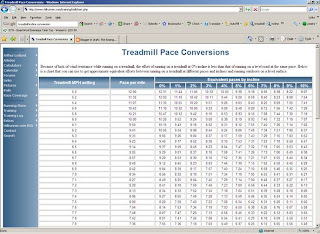 I recently looked at a chart that compared equivalent paces based upon running speed and inclines. It gave me the idea that I could run at a slower pace (for safety given the treadmill's belt slips) and still get the benefits of a faster pace by increasing the elevation. My run started roughly when my Garmin refused to set correctly. I nearly lost balance when the belt slipped while I was messing with the controls on the watch. Once I got that settled I pushed both my pace and the incline to a point where I was working fairly hard. About six minutes into the run I noticed that the belt would slip most often when I ran closer to the right edge of the tread belt. Moving closer to the left, the belt becomes more stable. Given that the tread belt is barely two feet wide, the range of positions is limited. However, an inch or two makes a big difference in terms of stability. Running uphill at speed becomes difficult after a while so I decreased the incline for a few minutes to recover and then moved through some different combinations of slower paces and higher inclines (and vice versa). I ended up covering about 2.3 miles at an average pace of 9:50. Considering the amount of effort I'd needed to get through this workout I was surprised to see that my pace was still in the nine minute range. I'm hearing about more rain this weekend but I'm hoping to get out both days to run on real hills that don't slip unexpectedly under your feet. In a way the new treadmill simulates running on technical trails - but not in a good way.